U.S. Education Secretary Betsy DeVos is under the microscope again. This time, some are criticizing the wealthy GOP booster after she told members of Congress this week that local schools and communities should decide whether to report undocumented students and families to federal immigration authorities. 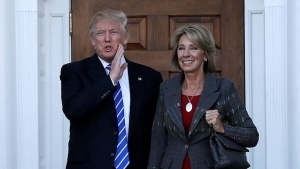 DeVos, who was selected for the top education post last year by President Donald Trump, has angered public school advocates before, over topics like teacher strikes, school choice funding, and a remarkably uncomfortable interview with 60 Minutes. Espaillat immediately rebuked the secretary’s statement, stressing that immigration policies are defined and executed by the federal government, not by communities. “You cannot have immigration law for one state be different for another state and it applies to everybody across the country,” he added. This is not the first time the secretary has faced controversy. During her tenure at the Department of Education, she has faced criticism for comments she’s made on school safety, black history, and other matters. In March, she said arming teachers “should be an option for states and communities to consider” during an interview after a visit to Marjory Stoneman Douglas High School in Parkland, Fla. Her most recent comments are drawing considerable backlash from civil rights groups. “Let’s be clear: Any school that reports a child to ICE would violate the Constitution. The Supreme Court has made clear that every child in America has a right to a basic education, regardless of immigration status. Secretary DeVos is once again wrong,” Lorella Praeli, director of immigration policy and campaigns at the American Civil Liberties Union, said in a statement. During the heated exchange with Espaillat, DeVos referenced a Supreme Court decision that ruled that all children — regardless of their immigration status — are entitled to a free public education. Critics pointed to that same 1982 decision, Plyler v. Doe, as they sought to poke holes in her testimony.